Here’s a quick and easy table top craft to dress up your dinner table! It takes only a small scrap of leather or felt to add some zip to an otherwise ho-hum napkin. These things are small, easy to store, and can be used as name tag holders for your next Fall feast. Each cuff takes just a minute or two from start to finish, depending on how careful you are with the corners. 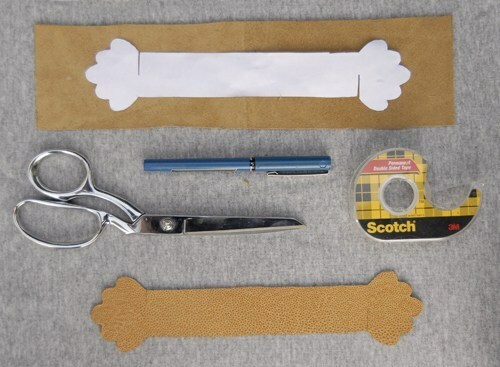 Just cut out the templates, trace them onto your leather and get to work with your Xacto knife or scissors. I’ve included three different templates for your crafting pleasure, and I invite you to follow the Melissa Esplin Two-Step Program. Step 1 is to recognize that you have a problem. Take a hard look at your table settings. Would you describe them as fresh and fun, or sad and wimpy. If you answered “sad and wimpy” with a disappointed frown on your face, you should be congratulated for your self-awareness. Step 2 involves firing up your printer and getting your craft on. If you find yourself making excuses such as “I just don’t have the time,” or “nobody really notices these things anyway,” or—heaven forbid—”drab table settings are a victimless crime,” stop right there. You’ve entered a No Excuses Zone. 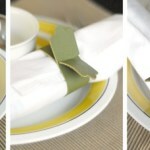 Your guests will notice your rad napkin rings. Your guests will think more highly of you. And you will turn over a new chapter in your life, a chapter marked by renewed self-confidence and crafting zeal. Thank you for your time. That will be all. Super fun! Love your photos-I found your blog from TCB. Congrats on being featured…I could sit and browse ISLY for hours! I think I found my new favorite blog…wrapped up my evening enjoying several pages of your posts. And might I say – super cute haircut you have! Oh, see, I’ve been on the fence about doing napkin rings for my son’s first b.day dinner party and you’ve pushed me onto the DO IT side. Thanks! i LOVE these, thank you for posting the how-to! will make these soon & use them as an excuse to have a dinner party. your ideas are so creative and fun! Oh that Chris. Clever guy that he is, did a really good job! Love this. Maybe I’ll do it for Thanksgiving! You have the best timing! I made a set of ‘Day of the Dead’ placemats and napkins a few weeks ago and I’ve been searching for a napkin ring tutorial ever since! Thanks!! love it! you know I am going to be thinking of this every time I have company, i’m sure I’ll put it to use many times. Thanks!